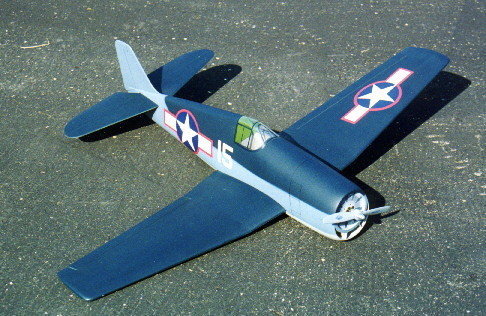 A close-up view of the original prototype painted in the colors of an F6F-3 operating with USS Essex' air group in August of 1943. The fuse is covered with fiberglass, and the flying surfaces are covered with silkspan and nitrate dope. 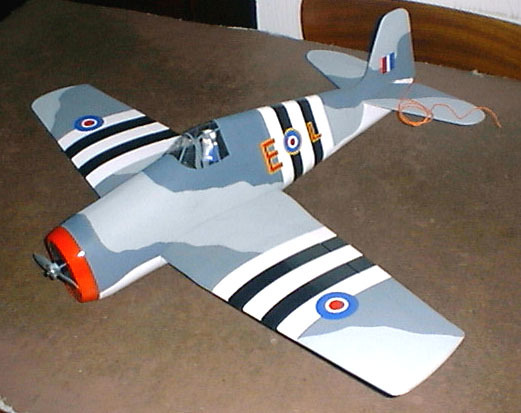 The airframe was painted with Floquil Military paints. This model was donated to the Academy of Model Aeronautics Museum collection. My friend Gordon Tarling's version is finished as a Royal Navy Hellcat Mk.I that operated in the Mediterranean in the summer of 1944. The model is covered with tissue and dope and painted with enamel paints.